The patient was known as No. 6587-0069. She was 10 years old, lived in Nigeria and had succumbed to a raging meningitis epidemic. But instead of receiving care from Doctors Without Borders, which was operating a treatment center in the Nigerian state of Kano, she received care from Pfizer researchers who were also operating in the stricken state—testing their new antibiotic Trovan. The day after receiving Trovan, one of the girl’s eyes froze in place. Two days later, patient No. 6587-0069 was dead. No one can know if the experimental drug Trovan, withdrawn from the market soon after approval, cost the little girl her life. What we do know is she was in a private-sector experiment in a poor country and alternate treatments were available. We also know that Pfizer paid millions to the Nigerian government and state of Kano, which charged that the drug giant “unlawfully conducted a clinical trial without obtaining a valid clinical trial certificate” and failed to obtain required approvals and consent from the patients. According to Wikileaks documents, Pfizer tried to extort Nigeria’s former attorney general to drop the lawsuits before paying the settlement in 2011. And, after a 15-year legal battle, the parents of Nigerian children who died after being given Trovan received payments of $175,000 each from Pfizer. Sadly, the Trovan deaths are not the last time overseas drug trials have raised questions. More recently, Seattle-based Program for Appropriate Technology in Health (PATH) conducted trials of Merck’s Gardasil and GlaxoSmithKline’s Cervarix—human papillomavirus (HPV) vaccines—on hundreds of Indian women and children, after which seven children died. Now judges in India’s Supreme Court are demanding answers. Though the jury is out on whether the deaths were related to the vaccine, the verdict is in on the ethics of for-profit drug companies testing medicines that may not be of use, or even available, to people in poor countries: questionable. Other questionable clinical trials have been conducted in India, an increasingly popular country for drug testing. Earlier this year, the European Medicines Agency (EMA) recommended suspension of drugs approved on the basis of trials conducted at GVK Biosciences in Hyderabad, due to questions raised by on-site inspection. A progression of drug research scandals has inspired India’s Central Drugs Standard Control Organization to amend the country’s pharmaceutical laws so that individuals harmed by drug trials or their families are compensated. 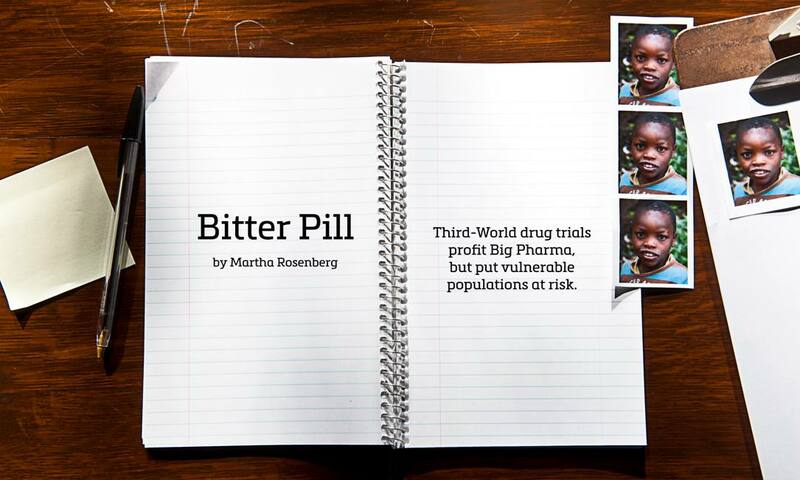 Conducting drug trials in poor countries presents a host of ethical questions. Do the subjects understand the risks? Even if they do, are impoverished people really in a position to turn down the promise of money or medical care? What about ill effects down the road, after the research is concluded and the drug company has moved on to a new study and a new country? Is follow-up care available? Arthur L. Caplan, Ph.D., director of the Division of Medical Ethics at the New York University Langone Medical Center, says there’s definitely a moral yardstick that can be applied here. “No one should conduct studies of drugs on people who don’t need or won’t be given the drugs,” he said. “Only if the drug will be made available free or for a reasonable cost for a significant period of time are such studies ethical.” Caplan consults for the World Health Organization. Caplan also believes patients would be better protected if informed consent were videotaped instead of recorded in writing, to ensure consent is really consent. Even in poor countries “people have cell phones and tablets,” he points out. 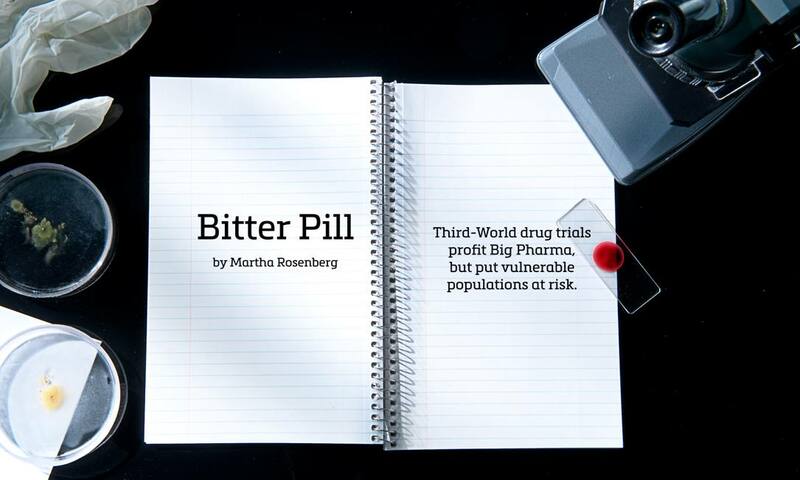 It’s no secret that drug research and development is commercialized. “Technology transfer” and for-profit partnerships have turned universities into pill development factories for the drug industry. Northwestern University, for example, made $700 million by developing the anti-seizure medicine Lyrica and selling it to Pfizer. The windfall “validated the nearly 15-year process from invention to market launch in 2005,” reads a Northwestern press release. Clinical trials also have been commercialized, posing clear risks to human subjects and driving their export overseas. Whereas human drug testing was once linked to and protected by medical or academic institutions, it has become a for-profit industry run by corporations called contract research organizations (CROs) hired by drug companies. CROs are experts at the clinical testing “game,” providing drugmakers services stem-to-stern: trial design, subject recruitment, enrollment and consent administration, regulatory compliance assistance and preparation of final submission-for-approval packages to the FDA. CROs will even do marketing and branding of new drugs. The largest U.S. CRO is North Carolina-based Quintiles Transnational, boasting 23,000 employees in 60 countries. By relieving Big Pharma of the need to maintain its own staff and streamlining the approval process and timeline, CROs are cost-efficient. CRO staff are often low paid, but doctors supervising CRO clinical trials can make as much as $300,000 a year for four or five trials. Per the U.S. National Research Act of 1974, drug trials must be overseen by an institutional review board (IRB) composed of medical professionals, laypeople and sometimes ethicists. IRBs are charged with monitoring human safety in clinical research. But like for-profit trials conducted by CROs, IRBs themselves are on the payroll. For example, some of the clinical trials conducted by SFBC International, a large U.S. CRO, were approved by a for-profit IRB owned by the wife of an SFBC vice president. The owner of another CRO, Fabre Research Clinic, which has since been shut down, founded a private IRB with his business partner and lawyer as board members. “Anyone who can bring together five people, including a community representative, a physician, a lawyer and an ‘ethicist,’ can set up” an IRB, says the PLOS article, making IRBs—like CROs—nothing but proprietary arms of drug companies. Just as global companies outsource labor to poor countries, outsourced clinical trials offer many advantages to Big Pharma. Regulations are less strict and sometimes nonexistent, and the risk of injury lawsuits is nil. Subjects tend to be compliant, and many believe they are being treated for a disease or receiving needed medical care and so are grateful. Subjects in foreign countries, especially poorer ones, are also desirably “drug-naïve”—they are palates untainted by the antibiotics, statins and sleeping pills that are de rigueur in industrialized countries. From 1990 to 2008, the number of U.S. drug trials conducted overseas leaped from 271 to 6,485. China (1,861) and India (1,457) are top trial venues, with Romania (876), Thailand (786), Ukraine (589) and Peru (494) also popular. There are a few rules in place for overseas drug testing—drugs must have FDA Investigational New Drug applications, for example—but preapproval isn’t required for studies, and on-site inspections are almost unheard of. There is no mandatory public record of the results of overseas drug trials, so unsuccessful trials can simply be buried. 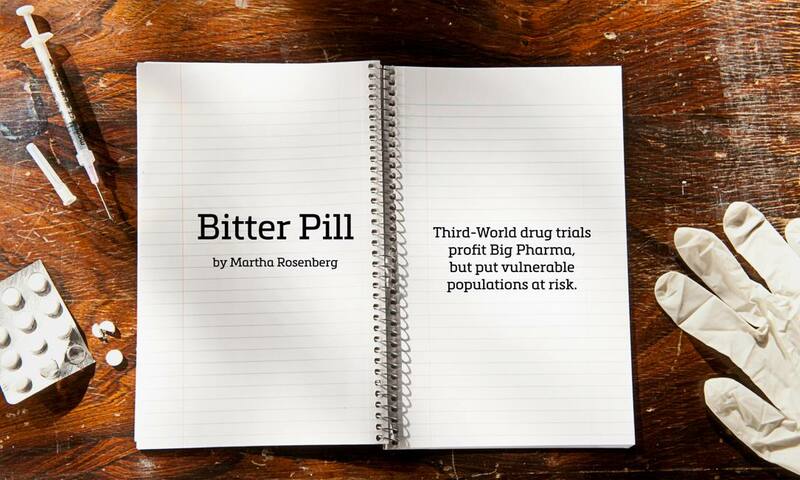 Yet in a twist of regulatory largesse, if the studies succeed, they are admissible to the FDA as part of the drug’s approval package, a win-win for Big Pharma. In another convenient loophole, the FDA in 2008 replaced its requirement that researchers abide by the World Medical Association’s Declaration of Helsinki with a fuzzier “good clinical practice” mandate. Even when they occur in this country, clinical trials seeking quick FDA approvals can be unsavory. Trovan, for example, was part of a troika of risky antibiotics, all of which were quickly approved and even more quickly withdrawn or severely restricted for safety reasons. Anne Kirkman Campbell, M.D., went to prison after “testing” the antibiotic Ketek on her entire medical staff, members of her family, and one percent of the town she lived in, Gadsden, Alabama, making $400 a head. Ketek manufacturer Sanoﬁ-Aventis replaced the domestic data corrupted by Campbell with overseas trial data and Ketek was approved over the safety concerns of FDA researchers. The overseas data included a trial with 4,000 infants and children, some as young as six months. During the same time period, the antibiotic Raxar was tested at the Tucson facility of Vivra Asthma & Allergy where FDA inspectors on a site visit found enrollment pressure on subjects and failure to inform them of risks. Vivra staff told investigators that trial results were falsified, that they were not “double-blind,” and that subjects who had no interest in participating in clinical trials were screened for trials without their knowledge. One principal investigator at Vivra literally plucked people out of the parking lot in order to get the lucrative fees paid for recruiting clinical trial subjects, reported to be in the thousands per head, charged a whistleblower at the facility. And patients who had pre-existing conditions that would put them at risk during the trials were brazenly used anyway. Raxar was withdrawn soon after Trovan was linked to 13 deaths. The Vivra debacle is just the tip of the iceberg, according to recent research published in the Journal of the American Medical Association. Of 78 published reports of drug trials in which FDA inspections uncovered significant violations, only three mentioned the objectionable conditions or practices in the articles. “No corrections, retractions, expressions of concern, or other comments acknowledging the key issues identified by the inspection were subsequently published,” writes Charles Seife, a journalism professor at New York University. Even when the fraud appeared to invalidate study findings, drug claims were not altered, according to Seife, misleading patients, doctors and journal editors alike. The reason for the lack of transparency? The FDA calls the material “proprietary” and also says it does not want to “confuse” patients.